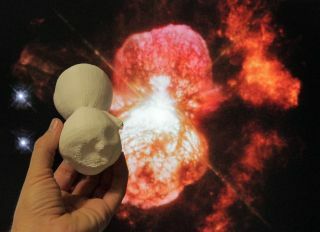 A 3D-printed model of the Homunculus Nebula is compared to a Hubble Space Telescope image of the object. Most astronomers rely on flat images to study cosmic objects, but a group of researchers is taking an alternate approach: They're creating 3D-printed models of a giant star system in order to study its physical characteristics and investigate its mysterious past. Eta Carinae is the brightest and most massive star system within 10,000 light-years of Earth, and consists of two stars surrounded by luminous shells of gas. A group of scientists looking to better understand how this system formed created complex computer simulations that predicted how the gas should move and change as the stars orbit each other. The science team also created a video detailing their discoveries about Eta Carinae, based on their findings. The same group of astronomers have been studying Eta Carinae with a variety of telescopes in order to probe its past and make predictions about its future. Examining the system with the instruments revealed shells of gas from previous explosions racing away from the most massive star at a million miles an hour. The new data allowed the researchers to track the cosmic wind coming off the primary star, and reveal expanding claw-like structures. At the same time, the 3-D printer turned up previously unseen fingerlike protrusions in the region where the winds from both stars collide. Together, the variety of methods produced the most comprehensive picture of the binary system to date. The results were presented by a research team coordinated by Theodore Gull, of NASA Goddard, last month at the 225th meeting of the American Astronomical Society in Seattle. The two massive stars of Eta Carinae orbit each other once every 5.5 years and are located about 7,500 light-years from Earth in the southern constellation of Carina (The Keel). In their orbit, the stars can be as far apart as the sun and Neptune, or as close as the sun and Mars. Two massive shells of expanding gas called the "homunculus" race away from the central stars, most likely resulting from an explosive event that caused the system to shine almost as brightly as Sirius in the 1840s. In 2009, Theodore Gull of NASA Goddard began to study Eta Carinae's two massive stars and the gas lobes extending away from them in both directions with the Space Telescope Imaging Spectrograph (STIS) aboard the Hubble Space Telescope. He turned up several unusual features in the gas lobes, including one that he compares to a Maryland blue crab. The "crab," with its clawlike features, is a remnant from more than 10 years ago, or about twice the time it takes the two stars in Eta Carinae to orbit each other. Observations reveal the diffuse gas bubbles expanding outward with time, racing away from the stars at about one million miles (1.6 million kilometer) per hour. Eta Carinae's great eruption in the 1840's created the billowing Homunculus Nebula, imaged here by the Hubble Space Telescope. The expanding cloud contains enough material to make at least 10 copies of our sun. Astronomers don’t yet know what caused the eruption, but new research is moving scientists closer to understanding this complex system. It was these observations that led Gull down the path of creating a three-dimensional model of Eta Carinae. First, theorist Thomas Madura, also of Goddard, used the detailed observations of the astronomical hourglass to build a three-dimensional supercomputer simulation of the central interacting binary. But the structures continued to remain elusive. Madura turned to a commercial 3D printer to probe the distant astronomical object. "As far as we are aware, these are the world's first 3D prints of a supercomputer simulation of a complex astrophysical system," he said. The team created printed models of Eta Carinae at three different times during its orbital cycle — when the stars were farthest apart, when they were closest together and three months after their closest approach. The result led to a surprising scientific find. "As a result of doing this 3D printing work, we actually discovered these fingerlike protrusions that extend radially out of the spiral collision region," Madura said. "These are features that we didn't really know existed." The scientists think that the features, which are too small to resolve with current telescopes, are real features that arrive from physical instabilities that result when gas streaming from one star essentially collides with a wall of gas from the winds of its companion. The printed 3D models should help the team and other scientists gain a better understanding of what is going on at the heart of Eta Carinae, as well as at its surface. A paper detailing this research was published in the July 8, 2014 issue of the Monthly Notices of the Royal Astronomical Society. The team intends to place the 3D print files on a website and make them available to the general public. Anyone with access to a 3D printer will be able to hold physical models of Eta Carinae in their hands. These 3D models could be helpful for educational purposes, as well as for the visually impaired, Madura suggested. "It's a great way to communicate complicated scientific results to nonexperts and the general public," Madura said. A new shape model of Eta Carinae's exterior gas shell reveals protrusions, trenches, holes and irregularities in its molecular hydrogen emission. The scientists who created the 3D computer simulations also created 3D printed models of the luminous star system. The brighter of the two stars in Eta Carinae — the primary star — is estimated to have the mass of 90 suns while shining more than 5 million times as brightly. The system shines so brightly that the second star wasn't found until 2005, and characterizing it has remained a challenge. "Eta Carinae itself is so luminous that we can't really clearly see the second star," said Madura. The research team suspects that the star has about 30 solar masses and emits the light as strong as a million suns. Although most scientists suspect that the brighter star had the eruption that created the gas lobes, Madura said, "We don't actually know which star had the eruption." The closeness of the two stars means that the stellar winds, full of material from the surface of the stars, stream outward and slam into one another. The dense wind from the primary star travels at nearly a million miles (1.6 million km) per hour. When it collides with the thinner wind from the secondary, which travels about six times as fast, the rapid deceleration produces a bow shock around the dimmer star. The shockwave creates bright x-ray light that changes over the orbital period of the stars, spiking upward only to fall as the dim companion moves behind the brighter star. Although the brightness fluctuations are similar in each cycle, they correspond to material flowing off the star and so are not identical. In 2009, the dip in brightness recovered faster than it had in previous cycles. The most recent cycle offered another surprise — in July 2014, the X-ray signal was brighter than previous observations, according to Corcoran. Despite the jump, the drop back to the lowest point remained consistent with previous observations. The changes are important because they reveal how much material streams away from the pair. "For stars, mass determines their destiny, but for massive stars, mass loss determines their destiny," Corcoran said. "By looking at these X-ray variations, we can tell something very important about how these stars are changing." In addition to studying Eta Carinae in the X-ray, Mairan Teodoro of NASA Goddard and a group of professional and amateur astronomers studied the system in a single wavelength of blue light emitted by helium atoms that have lost an electron. Light from the atoms tracks the conditions of the wind from the primary star. But these emissions can be very faint, and difficult to cull from the rest of the light waves emitted by the star. In 2009, Teodoro led the first international effort to track the helium signature across the southern hemisphere, collecting contributions from at least five observatories. In 2014, the team collected even more observations. Together, the data included over 400 observations by amateur astronomers. Studying the wide variety of data collected, the team was able to conclude that there were no significant changes in the brightness of Eta Carinae in the past 5.5 years. The steadiness of the wind from the secondary star is somewhat surprising, given that the larger, brighter primary is thought to be more stable. The deeper insights into what is going on around the visible edges of the binary stars may help put to rest concerns that the two may suffer a violent death in the near future. Like most massive stars, the pair found in Eta Carinae will end their lives in a supernova blowout. The timing is based on how quickly they lose their matter before they reach the point where they are no longer stable. "What determines the eventual state of the star is what's going on deep in the core," Corcoran said. The mass loss the team has observed takes place at the surface, not in the interior. However, that surface activity should be indicative of what is happening in the heart of the stars, according to Corcoran. At the moment, the surface activity seems rather steady on both stars. "We don't really expect [either star] to be a supernova," Gull said. "However, we can always be fooled."